The Sega Saturn Pro Action Replay is a cheat cartridge released as part of the Action Replay series. It was produced by EMS for Datel, although EMS released copies on their own. The Pro Action Replay is an upgrade over the Saturn Action Replay, serving as a 512KB Saturn Backup Memory cartridge and adding a communications port to interface with computers. 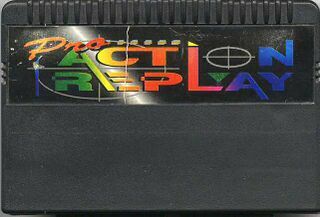 Pro Action Replays are not common, and were superseded by the Action Replay Plus which initially retained all the aforementioned features while adding Extended RAM Cartridge support. There was no official North American release of the Pro Action Replay, however Karat brought the device to Japan.